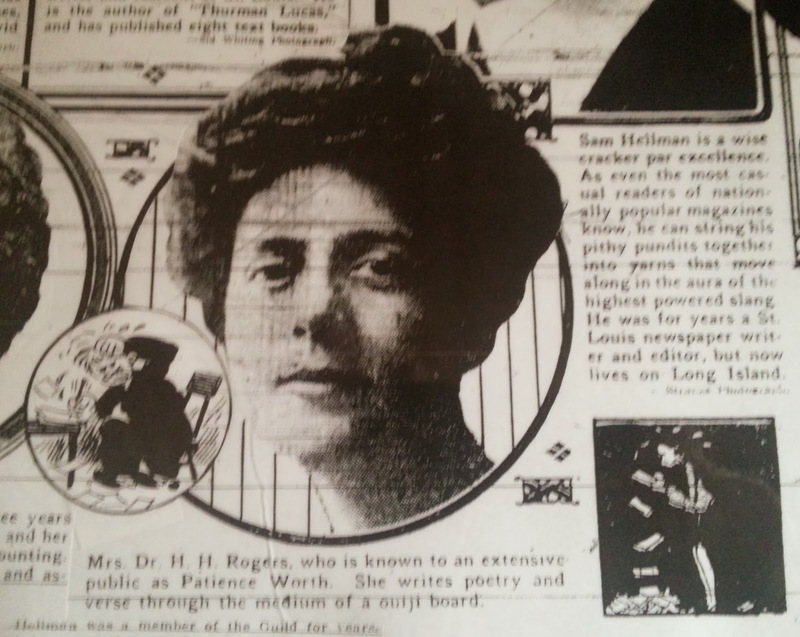 At the turn of the last century a writer dazzled the nation and left her mark on St. Louis. Pearl Curran was a writer and poet, but she is most famous for channeling Patience Worth, a medieval noble woman. It is Patience who is said to have penned the novels. Beyond channeling her muse, Pearl was a charter member of St. Louis Writers Guild. Pearl Lenore Curran (1883 – 1937) began life in a simple and unassuming way, on February 15, 1883 in Mound City, Illinois, and soon moved with her family to Texas. Pearl attended school until she dropped out in high school, stating she had a nervous breakdown due to the strenuous academics. She briefly returned to St. Ignatius Catholic School, but this lack of education would be an important factor later in her life. Pearl and her family moved to St. Louis at the age of 14 and her interest turned to music. When the family moved to Palmer, Missouri, they sent Pearl for voice training in Kanakee, Illinois. She showed talent as a singer and pianist. Leading Pearl to Chicago, Illinois where she was trained by the renowned J. C. Cooper. She first worked for the McKinley Music Company addressing envelopes for six dollars a week, and then sold music for the Thompson Music Company. Until the age of twenty four, Pearl worked in Chicago through the winter, and spent her summers in Missouri giving music lessons. Pearl married John Howard Curran in 1907 and the two lived a modest but comfortable life until 1913 when Pearl underwent a remarkable experience. During the height of the spiritualist’s movement, Pearl used a ouiji board, and channeled a medieval noble woman named Patience Worth. Together they wrote a series of novels that Pearl claimed she transcribed while having psychic experiences with Patience. A widely read and beloved writer, she grew famous not only as a literary sensation, but also from the many scholars who sought out her novels for the intimate details of medieval life that she was able to draw upon. Details which at the time were thought to be impossible for a high school drop out to have known. John Curran died June 1st, 1922 and she would marry two more times, though both would be short lived. The second of these marriages was to Dr. H. H. Rogers, and they lived in St. Louis. During this time she helped bring the St. Louis Writer Guild into fruition as a Charter Member, one of the original thirty members of the organization. In 1929 she was one of the featured authors in a St. Louis Globe-Democrat article on the prominence of St. Louis Writers Guild. In 1930 she moved to Los Angeles, California and lived the rest of her life with a friend, Mrs. Alexander Bailey Smith, Dotsie to those who knew her best. A thorough investigation was conducted by Dr. Walter Franklin Price who published his findings in the The Case of Patience Worth, in 1927. It contained 509 pages of eye witness reports, opinions, reviews, poetry and an autobiographical sketch of Pearl. The book covers the years 1913 – 1927. In an article for the July 1926 Scientific American, titled The Riddle of Patience Worth, Dr. Price requested anyone who could debunk Pearl come forward. No one ever did. Pearl was a fascinating woman and writer, I encourage you to learn more about her amazing tale! I originally wrote this in 2009 as Historian of St. Louis Writers Guild for a series of articles about the founding members in The Scribe. You need to check out the articles by James H. Hyslop he was an early psychical researcher, he exposed Pearl Curran as a fraud. It's too complex to go into but look it up if you get the time. Hyslop was not a skeptic, he was a believer in some mediums so he can't accused of being biased. I see no reason why he would of lied. Whoever wrote the anonymous comment about James Hyslop just doesn't know his or her facts. Hyslop criticized a BOOK about Pearl Curran and Patience Worth basically saying that the author, Casper Yost, did not do a very good job discovering what Pearl Curran had read and studied prior to her contact with Patience Worth. Hyslop did not declare that Patience Worth/Pearl Curran was a fraud. In fact he met with her for the first time after he had written his critique of Yost's book. The American Society for Psychical Research, for which Hyslop was chief investigator, published a rebuttal of Hyslop's insinuations about Pearl Curran after Hyslop died. Dr. Walter Franklin Prince provided a very good analysis of Hyslop's original comments in his study of Pearl Curran titled The Case of Patience Worth in which he refuted all of Hyslop's allegations. Those who are interested might want to take a look at my web site about Pearl and Patience at www.patienceworth.com.